We’re rounding up our selection of summer cleaning tips this week with a few jobs that also let you soak up the summer sun. That’s right, it’s time to focus your cleaning efforts outdoors and with so much taking place in the garden during the summer, you’ll want to make sure you cover the following cleaning jobs before you invite everyone round for a barbecue. Remember that we offer specialist curtain, upholstery and carpet cleaning services here at Apple Clean that are certain to leave your domestic or commercial property in great condition. It’s not a huge job to start us off, but it’s necessary all the same. We usually store our lawn mowers in the shed or the garage without thinking about removing some of the caked grass that remains in the mowers storage compartment. However, cut grass can play a huge part in the nutritional value of your garden, so keeping hold of it in a compost bin during the summer isn’t a bad idea. 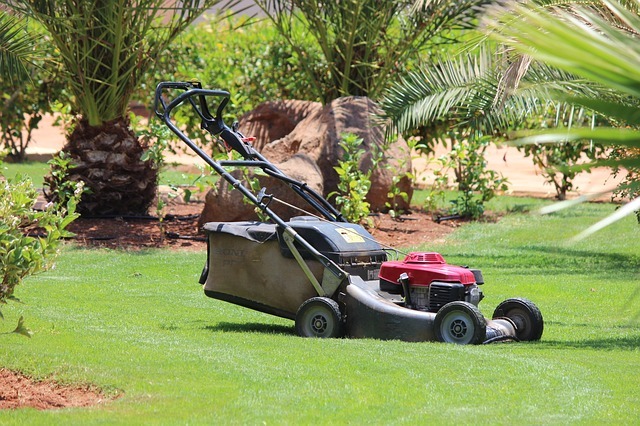 On top of this, you’re probably going to find yourself using your lawn mower quite regularly over the coming weeks, so making sure it’s regularly cleaned of any excess grass is important to maintain its condition, such as keeping the blades free from rusting. Driveways can become increasingly untidy very quickly, especially if you live in a built up area. Along with the odd piece of litter, you might also struggle to contain an outbreak of weeds over the next few weeks. In order to get rid of all the mess in your driveway, you should start by moving anything that’s clogging up space. Once you’ve done this, you can equip a power washing hose and get rid of any excess dirt from the concrete. A garage clean-out can be time consuming, with so much of the things we don’t need regularly taking up plenty of space. The best way to clean out a garage is to take it one step at a time. Start by removing old bits of wood, plastic, paints, materials and furnishings that you no longer need and sort them into separate piles. Once you’ve emptied your garage, you’ll need to dispose of unwanted items at your local dump. Once that’s over, you can start power washing your garage and prepare it for restocking with all the items you do need. For more information on our specialist cleaning services, get in touch with Apple Clean today. We’d love to hear from you.